Health is wealth, and across nations, different innovations have been pioneered by governments and organizations to improve the wellbeing of citizens by making healthcare services more accessible. Before the modern digital age of aggregation and orchestration of demand and supply, in platforms under the positive continuum of network effects, the healthcare systems in most developed nations have followed such redesigns. Yes, ecosystem players make it possible for those offering health services and those needing those services to have efficient equilibrium within healthcare service frameworks. In Nigeria, however, we are just beginning to build such systems as enablers of healthcare service delivery remains inadequate. One company that is looking at how to pioneer this new future where ordinary citizens, employed or otherwise, can have healthcare plans is HealthPoint.ng. Unlike the HMO model where most times, users must be banded in groups, HealthPoint offers an on-demand and fully business-to-consumer solution, among others. In other words, anyone can buy the plans without being part of any group or organization. Our belief is that healthcare should be accessible to everyone; whether they are young or old, male or female, sick or healthy, regardless of their socio-economic status. We are propelled to serve major health deficiencies in urban, rural and peri-urban areas with an ultimate vision to promote and facilitate inclusion health in Africa particularly to contribute to the Universal Health Coverage agenda. 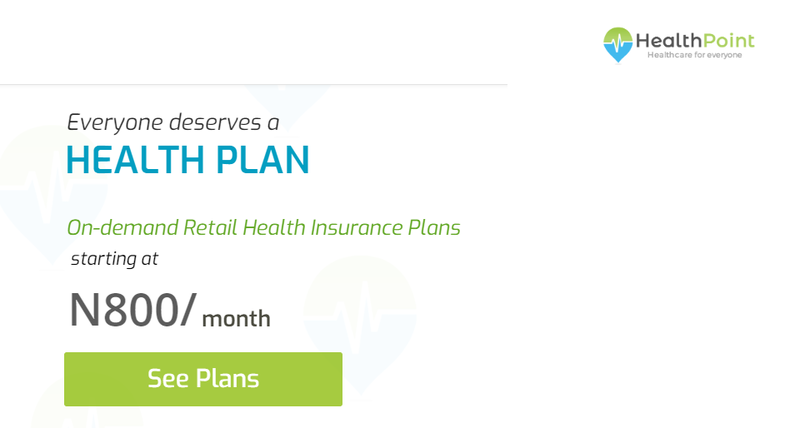 We have designed the most affordable and easy-to-use health management plans at monthly subscriptions, to fit seamlessly into your monthly budget/cash flows. You can select from and access a wide number of hospitals of your choice from our A-list hospitals/provider network for medical attention and complete healthcare. This vision of democratization of healthcare is what Nigeria needs. As an entrepreneur in the healthcare space, through Medcera, I have observed that Nigeria must innovate and improve the number of its citizens covered with health insurance. Stuck in single digit percentage national healthcare coverage, primarily via HMOs and sub-optimal government schemes like the National Health Insurance Scheme, bringing technology into the space will engineer new product classes. In a recent piece in Harvard Business Review, I explained a future which is possible in the Nigerian healthcare sector. Interestingly, that future can only happen when startups like HealthPoint thrive. Yes, until we can get citizens to have adequate health insurance, the healthcare industry will not have functioning equilibrium points to keep the nation healthy. There are things which are very hard pre-internet especially in a place like Nigeria: on-demand retail health insurance plan. But with the web, the capacity to manage network of clinics, patients and healthcare ecosystem players becomes easier. HealthPoint is taking advantage of the web to deliver a service which can serve people across the nation. Simply, ICT is facilitating the process of socio-economic development in Nigeria. It has offered new ways of exchanging information, and transacting businesses, efficiently and cheaply. It has also changed the dynamic natures of healthcare and financial industries and provided better means of using the human and institutional capabilities of the nation in both the public and private sectors. Increasingly, technology is rapidly moving Nigeria towards knowledge-based economic structures and information societies, comprising networks of individuals, firms and states that are linked electronically and in interdependent global relationships. This remarkable success of ICT in Nigeria is what HealthPoint is tapping as it executes its business model. By using the web, it reduces its marginal cost, improving its capacity to scale the service. Health insurance protects you from unexpected, high medical costs. You get free preventive care, like vaccines, screenings, and some check-ups. Besides the individual plans, the firm also offers the typical group/business packages. The unbounded distribution capabilities which Internet makes possible will unlock many new business models. HealthPoint has demonstrated that we can find new sectors to redesign in Nigeria with technology. The broad insurance sector has been extremely impervious to technology but that is changing as broadband penetration continues to deepen nationwide.